Stanley Picker Gallery is pleased to host a new body of work by Kingston University staff members Joshua Evan and Antonis Sideras, and their collaborator Liberty Antonia Sadler. The work can be viewed as complementary to the themes and discussions raised within the Gallery’s current main exhibition Haus der Lose / House of Lots by Vienna-based artist Katrin Plavčak. Tales, Mimicries and Mythologies is an exhibition uniting three artists from diverse backgrounds with distinct voices, in their efforts to make sense of the UK’s dramatic departure from the EU. The starting point of this exhibition has been the way in which Katrin Plavčak reflects the current political affairs shaping the future of the UK, through her works in Haus der Lose / House of Lots. Through the montage of video and sound appropriated from broadcast media, Joshua Evan’s work investigates what these uncertain political times might mean for our lives in a post-Brexit, post-truth world. We have been debating the issues for more than three years and have heard many voices with differing opinions and agendas. Yet, despite the fast approaching deadline, we are still uncertain of what this divorce will bring. How do we have faith in the decisions of the few who hold the power over our futures when trust is lost? Art imitates life. Performance mimics our state of affairs. 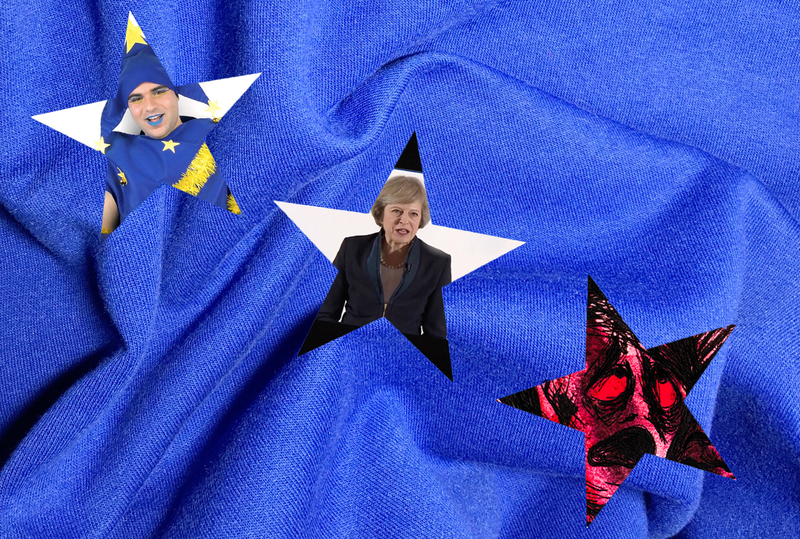 When Antonis Sideras puts on a ’Brexit Christmas tree’ dress made out of felt and tinsel, they portray a parody of a blissfully ignorant ‘Lady Youropa’, who is about to be confronted by shocking news. Sideras’ experiments with video performance and a trash x camp aesthetic, satirise Europe’s response following the results of the EU referendum. Through uncontrolled figurative drawings, Liberty Antonia Sadler’s series ‘Overlords and Overloads’ explores the personal & psychological responses to big political decisions. The grand narrative of Politics can disassociate the individual away from how government policies have real consequences on their life and wellbeing. When one finds themselves trapped in a ‘post-truth’ society, how can we even trust our feelings?